I joined Facebook, the online social networking site, about a year and a half ago. Back then, Facebook had opened its site to third party developers and a large wave of people joined, jumping to about 30 million users. There seems to be another wave of users recently and the latest figures show 150 million users. And probably increasing. I find myself using Facebook for most of my emailing, a lot of my photo-sharing, some light blogging, event organizing. And I link most of my other online activities to my Facebook wall. It’s an amazing tool, often time-sucking, but always useful for keeping in touch with friends who are all over the world, and sharing interesting links. I used to do a regular mass email, alerting people to things I’ve been doing. Now I just let Facebook take care of that. It could be alarming, entrusting so much of my personal information to 189 other people who may be careless with it. 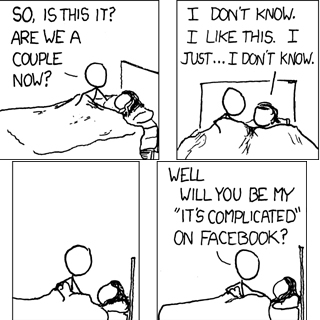 But I set the privacy settings pretty tightly. And I’m prudent about which Facebook applications I use. What more can you do? Life has always been full of risks. At the beginning of the year, I accepted my 150th friend. And considered capping it off there. Shut the gates and put up the no vacancy sign. I’m a tidy guy. I go through regular cycles of purging everything I don’t need or use. But it doesn’t work that way with people. People aren’t old newspapers or fraying socks. I chose 150 as the maximum because of Dunbar’s Number, an idea popularized in the Tipping Point. The concept theorizes that a group works best up to about 150 people. It’s the maximum number of people that the human brain is able to conceptualize as one group, knowing everyone’s relationship to each other. Beyond that, accountability starts to decrease, competing factions start to naturally form separate groups. The plan was to only accept new friends if I unfriend someone else. These unfriended people would be someone who I rarely interact with on Facebook and who I never see in real life. But I just couldn’t do it. It seemed unnecessarily mean. Still, some limits had to be set on who was able to have access to all my photos, photos of my friends, personal information on daily activities of myself and others. So I devised guidelines on who to be Facebook friends with. I’m now at 189 friends. My social network is well past its cohesiveness, apparently. And it appears to be burgeoning recently, with a wave of people joining. Some tipping point seemed to have been reached. These are the criteria that I seemed to be loosely using on whether to accept friends. The following are automatic ins. • Collaborators in dance or music. Grueling hours of rehearsals and getting naked together in dressing rooms form permanent bonds. • Current co-workers. 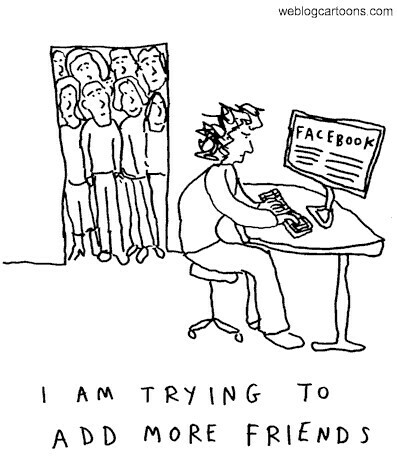 How awkward would it be to ignore a friend request from someone you see every day? • We’ve lived together. No secrets there. • Fellow graduate students. We were a close knit group. • We’ve traveled together. Nothing bonds people more than traveling together. • Acquaintances who always gave off a good vibe. • Teenage kids or younger siblings of my friends. Even though they all have 700 friends. • The more mutual friends we have the better. • We recently connected and they seem like someone I’d like to know more. • People who write a note of greeting instead of just send the request. So I guess that’s pretty much anyone. The only people I’ve ignored are those people who I don’t know and have never met. Or I barely know but can’t remember any kind of interaction with them. Also, people with 700 friends are obviously in it for the popularity contest, and I tend to ignore them, unless they’re kids of my friends. They can’t help it if they grew up in the age of social networking. The next step for Facebook should be giving people levels of access. Right now, it’s just two levels. Either access to everything, or almost nothing at all. It’s not useful. I’d like to see several circles of access. Like one for friends, co-workers, family, old classmates, etc. That way, embarrassing party photos could be limited to your drinking buddies. Interesting acquaintances you just met recently might have an introductory area of access. And these circles could be overlapping. So many applications already do this in clumsy ways. There are Top Friends, Girl Friends, Dance Friends. It’s natural to want to make order out of the community of friends. Otherwise, it’s just a mass of people milling around your Facebook house. Some people you want to have tea with in the living room. Others you want to laugh and drink wine with in the kitchen. There may be one or two you want to plop in the basement and shut the door. And you certainly don’t want to mix these crowds. Yeah I agree… I thinl I was actually too careless when I started facebook and accepted some “friend request” when really, if you haven’t kept in touch with someone it’s usually for a good reason! But it is a useful tool especially when you have friends a bit all over the world! The older you get, the more you realize that any friend you already have is well worth keeping. Young people take relationships more for granted. The cartoons gave me a laugh 🙂 Thanks for sharing them. I agree that different permission levels would also be helpful. it’s interesting how the idea of a ‘friend’ has been redefined through social networking sites. one of my friends has actually created a new profile with a pseudonym and invited a smaller circle of friends for that one! I feel in the, The Secret Handshake is very nice and always useful in facebook user.I am always facebook like in the friends field development. i need to know how many friends i can have on facebook? i mean, what’s the maximum amount?